My gg grandfather Dr. Wm C Cross established hospital headquarters for Woods brigade at the Mickey/Michie house. When we were there last Fall, we went to the Pebble Hill intersection someone had directed us to. The roads have been moved and we did not receive precise instructions. I just stood there and wondered exactly where the house was, where the dead were buried, and how in the world Dr Cross was able to perform his duties under the circumstances. On my next visit to Shiloh, I would like to stand on the actual ground where the house stood. I cant really explain it. But I would like to know exactly where it happened. Surely there is someone still alive who knows exactly where the house was located? Dr Cross originally enlisted as surgeon of 16th AL at Courtland, AL. He was promoted to senior surgeon Woods Brigade and served as such at the Battle of Shiloh. Woods Brigade was 3rd Brigade, 3rd Corps, Army of the Mississippi CSA and included 16th AL, 27th TN, 44th TN, 55th TN, 3rd MS Bat, 8th AR, 9th AR Bat, MS Bat, and GA Dragoons. "The Mickey house had been selected by Dr. Cross (my gg grandfather) as hospital head-quarters for our brigade. By his order tents had been erected for the comfort and protection of the wounded in the yard. After examining wounds and temporarily dressing them on the field, Dr. Noblitt, aided by Dr. Chandler, had succeeded on Monday morning in transferring their wounded from the field to the Mickey house, and as comfortably quartered as could be expected with the surroundings. Rain fell Sunday night. About two o'clock p.m. Monday there was a ruinous stampede among the wagon and ambulance men, and was not fully quieted until night. It happened that a man came riding at full speed among the trains, crying, "Take care of yourselves! The Yankee cavalry has broken our lines, and will be on you in a minute!" Many of the drivers took one horse or a mule, and made all possible speed to Corinth. Others drove to the Mickey house and unloaded the wounded on the ground, without tent or fly. The ground was covered with the wounded, the dead, and the dying. After dark the rain fell in torrents upon hundreds of the poor fellows. Their agonizing cries, moans, and prayers for help and water were audible above the dashing rain and rolling thunder. But in the long night-watch the rain ceased, the thunder hushed, and so had the cries of the suffering in the stillness of death. Morning came, and with it a melancholy sight - a sleeping camp. Men lay in every possible posture, with eyes closed as if in sleep on crimson beds. The rain had washed the blood from their clothes and blankets, making the earth red. Welcome to the group, Laura. Great stuff about your g-g-grandfather. And I'm guessing everyone here understands about wanting to stand on the actual ground. No explanation needed. We've got some pretty knowledgeable folks here about the local history around the park, so I'm betting someone can help. I'm thinking of a few of them right now. Thanks for the warm welcome Perry! Happy to be here and looking forward to learning more about Shiloh from the members here. This first one (which can be found in The Life of Albert Sidney Johnston) is an inaccurate construction, which was used by Southern forces during the attack on Shiloh. Mickeys was an important landmark, and is indicated as being northwest of a major road intersection. This second map (which can be found in the Jeremy Gilmer Collection at University of North Carolina) is extremely detailed, showing minor roads and feeder streams. Using the 'slide bar zoom' at top [about one-quarter distance to right], then moving the 'pink box' on the master map in the upper-left towards the Tennessee River [slightly, until the CSA Flag indicating Headquarters enters the view on the right] you will find 'D. Mickey' just north of Bark Road, and just east of a road that runs north from Monterey to Stantonville. Of particular interest: a stream is indicated just west of Mickeys, adjacent to the house, which could have been put to good use by surgeons. I provide these two maps as a means of beginning your search. Thanks Ozzy! That second map is one I have not seen before. It places the Mickey House NE of the intersection and just east of the stream you refer to. The "vague instructions" I received indicated that the house was on the SE corner of the intersection but the ground just didnt seem right to me. Honestly I have to tell you that I kept looking over on the other side of the road. I have no idea why. 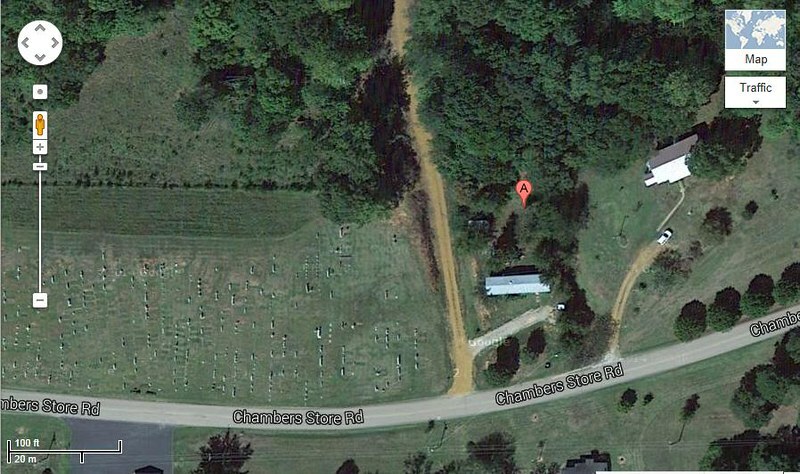 A church cemetery abuts the property where the house is shown on the map you provided. The cemetery has some old graves but I didnt see any prior to 1862 - didnt really look though. Interesting. I wonder if the locals later buried people in the same area where the dead CS soldiers were buried? IF I knew how to attach a screen shot of google satellite image, I could show you what Im talking about. I'll have a look at the 'satellite view' and see if anything jumps out... Meanwhile, I find it interesting that one CSA map shows Mickey's east of the intersection, and the other map places it to the west. Proximity to the stream (if it has not been diverted) should solve the problem. As regards cemeteries, I would expect burials to have taken place in proximity to Mickey's, similar to those that took place in vicinity of Pittsburg Landing, although better managed, and possibly establishing a new, well-defined cemetery. Names of the dead would have been marked on temporary wooden boards, if known. But, Federal forces took control of the area around Mickey's during the Crawl to Corinth, and I do not believe the locals could have done much to 'better preserve' the Confederate graves: but they would know where the burials took place; perhaps adjacent to the existing cemetery you mention. Was able to identify the burial ground in Michele's post as Pebble Hill Cemetery of McNairy County, at 2697-2851 Chambers Store Road. Only about a dozen Confederate soldier graves, mostly with last names of Glidewell, Harrell, Harvel, Harvell. Was expecting a lot more (with a lot of them marked 'unknown.') Only two people with last name of 'Michie' buried at the cemetery. Thank you all!!!! for your generous willingness to help me and for your informative replies. I know it may seem crazy to some, but I am determined to track down the specific location and stand one day on the same ground where Dr Cross worked. Thank you Michele for posting the satellite view. I couldnt figure out how to do that. The satellite view seems right to me - at least according to the map that places the Mickey house NE of the intersection. As Ozzy pointed out, there is that other map which places it to the W of the intersection. What does everyone else think? Ozzy - Thanks for posting the Find A Grave links! The Wm Glidewell of 14th TN Cavalry who is buried in the Pebble Hill cemetery was listed as William Gladwell - present in Jun/July 1863 and William Glidewell - absent with leave in Aug 1863. NFR. So it seems he was not a casualty of the Battle of Shiloh, but was evidently buried there later. See what I mean about being a helpful bunch? They're bad that way. You're probably right about the soldiers in the cemetery. I'd wild-guess that they were local to the area rather than being battle casualties at Shiloh. I think Ozzy said something about soldiers from the battle being buried under temporary headboards, which is almost certainly the case. So it's quite possible that their exact graves have been lost. As far as standing on the same ground as your ancestor being crazy, you'll have to find a different group to get that reaction. I was comparing the 1863 Jeremy Gilmer map to the present-day Google representation: the roads match up pretty well; from the Pebble Hill Cemetery, you can follow Chambers Store Road east, to where it intersects with Harrison Road; then follow Harrison Road east to Bark Road. The road lines match, although I believe most Confederate maps label the entire route as 'Bark Road.' Also, I believe there was a 'Ridge Road,' running parallel to the eastern, Shiloh-park end of Bark Road, and slightly south of it (mentioned in several histories, but no longer obvious today.) Just down the road to the east, maybe a mile from the cemetery, is the site of the Battle of Fallen Timbers... which bought the Confederate hospital time to evacuate wounded south to Corinth. Now, about that cemetery... Then, as now, most people do not intentionally build homes next to burial grounds. So, if Michele's location for Mickey's House is correct, the cemetery came later than the house. And later than the road. How much later? Which leaves me wondering: is the dirt road, visible to the west of Mickey's in Michele's post, the original Monterey-Savannah Road? Ozzy thank you so much for your continued help. I really appreciate your analysis of the old maps and the present day images. I wondered too if that dirt road might be significant. I really wish I could find a picture but havent been able to locate one either. Surely one exists though? Perhaps this description of the roads at the time would help with pinpointing the location? Corinth and Pittsburg Landing, about eighteen miles apart as the crow flies, are connected by a good ridge road. Another road from Corinth follows a line south of the other, runs through Monterey and into the ridge road between Owl and Lick creeks, where the Federal line was posted. From Monterey a road ran north to Purdy, intersecting the ridge road, and another ran northward toward Savannah, also intersecting the ridge road at Mickey's house. Beyond Mickey's, toward Pittsburg, the ridge road merges in the bark road. Well spotted, that the Ridge Road was sometimes confused with the Bark Road, which was sometimes confused... That seems to be one of the dilemmas of the Pittsburg Landing vicinity: what were the local road names? Has anyone been to the site of Mickey's? Has anyone taken a picture of the site? Ozzy, I will attempt to have a local show me the site and take some pictures in the near future (unless I forget!). Apparently the member @C. Rickman knows where it is located? I found this post from Feb 2012. Sorry - new here and dont know how to quote a post from another thread or how to "tag" another member. mickey's was located in what is now pebble hill. there are unmarked graves in the cemetery there that are supposed to be confederate graves. most of the graves were excavated in 1867 to determine which army they belonged to, if they were union they went to the national cemetery if confederate they went into one of the burial trenches on the park. there is a marker there for the hospital but not much else, it has been in private hands all this time, there is an old house from early 1900's where the mickey house was. Ran across another map... this one from the 'Atlas of the OR' and is labelled as the map submitted by General Beauregard to CSA HQ at Richmond, along with his report. There are three maps on the page: the one of interest is upper-right corner, 'Map of the Battlefield of Shiloh.' It confirms the reported location of Mickeys 'along the Monterey/Savannah Road, at the intersection with the Bark Road,' and places Mickeys in the NE corner, with the stream just to the west. This map compares nicely with the Jeremy Gilmer map (1863), with a few items of interest: Mickeys is shown as two buildings; the location of Stantonville is wrong on one of the maps (shown on both maps along the Purdy/Pittsburg Road); the Monterey/Savannah Road is shown to cross a meandering stream north of Mickeys, on both maps, which would appear to add credibility to the dirt road shown in Michele's post being the original Monterey/Savannah Road. No problem, Laura, the way you did it is fine. That's C.D., the gentleman I had mentioned in our earlier conversation. He's one of the very best bets for information about the house and property. I'm betting we can get some more current versions when Jim gets on the trail. I'll buy you a beer, Jim. Honest. Very interesting. That map seems to show Mickeys to the west of owl creek where the other map shows it between Owl Creek and Lick Creek? Or am I reading it wrong since its not oriented North to South? Had another look... Owl Creek appears to be half-mile to a mile north of Mickeys, on both maps, with stream adjacent to Mickeys meandering north to join Owl Creek. There is another Beauregard map that shows Mickeys north of Owl Creek... recommend, do not use that one. That is the 'inaccurate Confederate Generals map' (where Mickeys is actually indicated by word 'Johnson'). N.B. When you 'blow up' Plate 11, the words 'Plate XIV' appear on the upper-right corner. That's the correct map. N.B. Or, just ignore this map entirely, and stick with the Jeremy Gilmer (1863) map. Only found this map of interest because it showed two buildings at location of Mickeys. Ahhhhhh. Thanks for clarifying Ozzy. As you deduced I was looking at the wrong map - the one that shows Mickeys as Johnsons. Thanks for pointing out the correction. About those two buildings at Mickeys... Interesting, because Beauregard included them on the map, after he had been there. And does not really matter which was the house, and which was the stables... There would be wounded men in every available shelter, being tended to. I was searching for information about the 10th Mississippi (a regiment that served in Pensacola, before being sent to Corinth, in time for Shiloh) and found that after the Battle of Shiloh... after the Battle of Fallen Timbers... the 10th Mississippi was involved in a skirmish at Mickey's Ridge. While trying to narrow down the date of that skirmish, I ran across a metal-detector club site... and a post there queried a skirmish, after Shiloh, between Monterey and Mickey's White House.